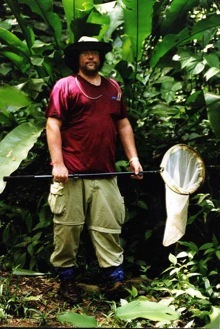 Former undergraduate Stephen D. Gaimari (BA Clark Univ., 1990), who went on to graduate work in entomology culminating in a PhD (Illinois), has discovered a new species of stiletto fly which he has named Ozodiceromyia livdahli. No ordinary bottom-feeders, the larvae of this spectacular fly, found in Arizona and Mexico between 1000 and 2000 meters elevation, attack grubs and other insect larvae in the soil, including pests of agricultural crops!! Dr. Gaimari, currently Program Supervisor at the Plant Pest Diagnostics Center, California Department of Food & Agriculture, chose to study insectsafter observing that if his professor could actually make a living doing that, then he certainly could, as well. While this is not Dr. Gaimari’s first contribution to science, it certainly is his most important to date. Dr. Gaimari as an undergraduate, on expedition in Bermuda. Dr. Gaimari is on the right moped, not to be confused with Michelle Willey (Ph.D. '95) on the left.